Over the coming weeks and months there will be many stories and recollections of the late Bishop of Massachusetts, Tom Shaw. He touched people all over the world with his deep spirituality, humility, good humor, and passion for justice in the name of the Gospel. All together these memories create a kaleidoscope of a faithful life lived in service of our Lord; a life that impacted thousands in ways gentle and bold, public and private. Some reflections will be shared quietly among friends and colleagues, others will be shared in newspapers and liturgies, still others will be pondered and treasured in the hearts of individuals. I had the privilege of serving under Bishop Shaw for a quarter of his 20-year episcopacy. There are others that knew him for much longer and with much deeper intimacy. 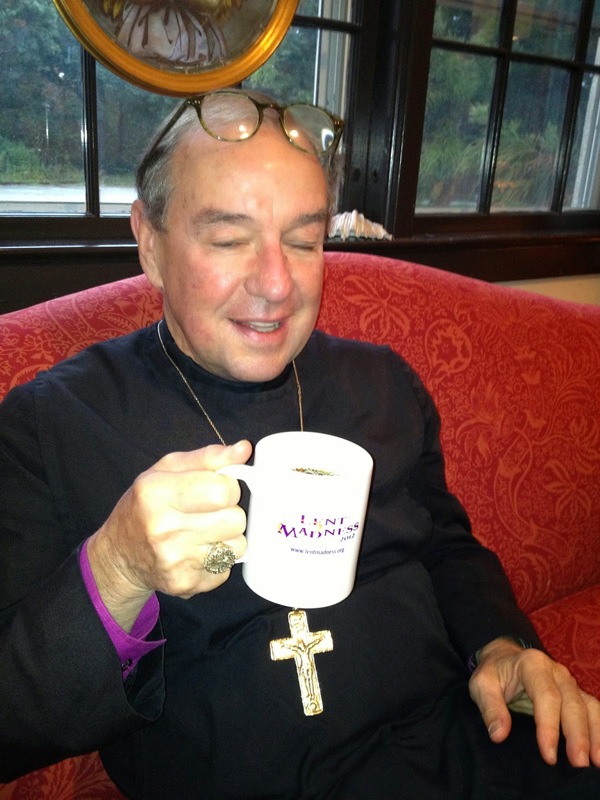 Yet I find myself compelled to share a few thoughts about a man who has been an important part of my own spiritual journey over these past five years in the Diocese of Massachusetts. A few years ago Bishop Shaw called the church to ask me if I would become a member of the diocesan Commission on Ministry. ("Hi it's Tom" -- panic as I thought "Who the heck is Tom?" and then "Oh, that Tom"). I begged off but offered to help him with any other projects that might "better use my gifts." At a subsequent visitation he told my congregation, with a twinkle in his eye, that he was "stunned" at my response since "no one ever said no to me before." Well, several months later he called again, this time asking if I would help him brainstorm some ideas to help him better communicate with the diocese. Well, the last thing the internet needed was Tom Shaw tweeting. Just not his thing. At all. So social media was out. But as I thought about it and talked with him it became clear that the bishop was a master storyteller with the ability to perceive the Spirit in unique ways. I mean, he was a monk after all. So I thought a video project would make the most sense. We got diocesan Communications Director Tracy Sukraw on board, hired a videographer, and "Monk in the Midst" was born. We had several planning meetings -- all at a coffee shop in Harvard Square near his monastery and soon started filming and releasing seasonal and topical videos starring...Bishop Shaw. The most memorable of these experiences, for me, was going to Copley Square to film an installment a few days after the Boston Marathon bombing. The place was still crawling with news trucks and reporters and police on a beautiful spring day. Before setting up we spent a good amount of time taking in the impromptu memorials comprised of t-shirts, flowers, running shoes, teddy bears, and hand-made signs. And, following his lead, offering silent prayer for the victims and their families, for the city of Boston, for people everywhere suffering from violence. Tom exuded a prayerful presence in the memorial area as the bustle of Boston swirled around him. People looked stunned, or resigned, or tearful and I just sensed the bishop's love for all of them as he stood in the center of it all. This is the image I'm left with as I reflect on Tom's life and ministry: a monk in the midst of it all, offering presence and comfort and hope; standing as an icon of sorts, a window into the divine love of Jesus Christ. These last months of his life have been hard for us all as the effects of the brain tumor ravaged his body and mind. But the one think it couldn't touch was his spirit. Because Tom Shaw himself always pointed towards the Resurrection. And thus this time in our common life is truly an Easter moment. Easter reminds us that despite the tragedies and trials we all face in this life, rarely as public as with a bishop, death doesn't get the last word. We don't remain on Heartbreak Hill; death doesn't win. Life does. Because when Jesus emerges from that tomb life wins out over death and that false boundary between life and death is breached once and for all. So there remains life in the midst of death; just as there remains in our memories a monk in the midst. May Tom's soul and the souls of all the faithful departed, through the mercy of God, rest in peace and rise in glory. Thankyou for that beautiful memorial to Bishop Shaw. Wow, that was beautiful. I only met him once, but it was enough to touch me in a way that I won't soon forget.